I like this approach to teaching but I am a little confused by the specific experiment. 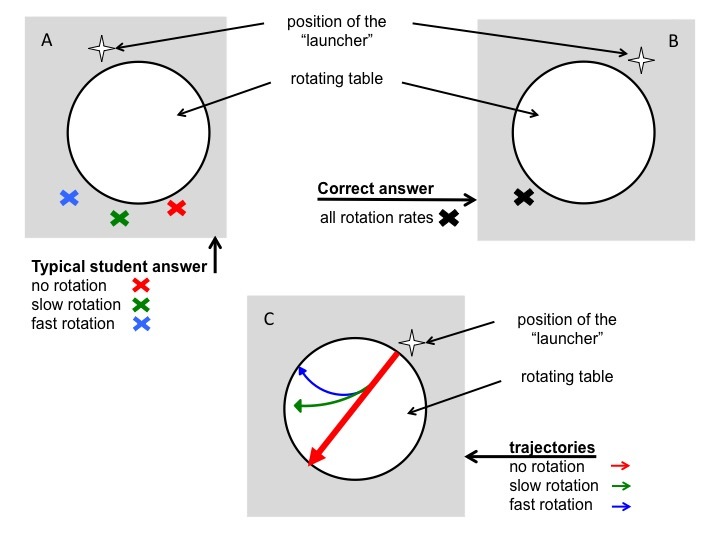 If an object is launched radially from the outside and has no other forces on it, then it should go straight through to the opposite side of the table whether or not the table is rotating. But since the launcher is rotating as well, it should cause the velocity of the ball (upon exiting launcher) to have a tangential component when viewed in the nonrotating reference frame, which would indeed make the ball head off to the right. In that case the [nonrotating] catcher should indeed move away from the antipodes of the launch. Also if the ball is actually rolling (as opposed to gliding or skidding), then that implies there is significant friction which I guess would have a net effect of dragging the ball along with the table. Am I looking at this wrong? 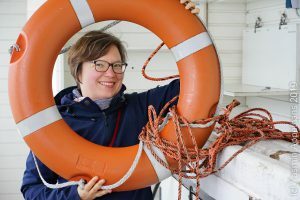 I’m teaching undergrad physical oceanography this fall and thinking of incorporating more hands-on stuff than previously. Hi Barry, Thanks for your comment! I am not sure I fully understand it, though. 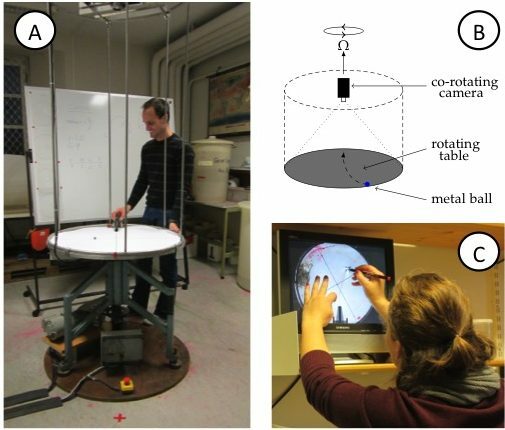 The point we were trying to make is that even an object going straight across the table (like the ball in our case, or even a ball that is thrown across without ever coming into contact with the table) will still look like it is traveling on a curved trajectory when seen from within the rotating frame (i.e. from the co-rotating camera). 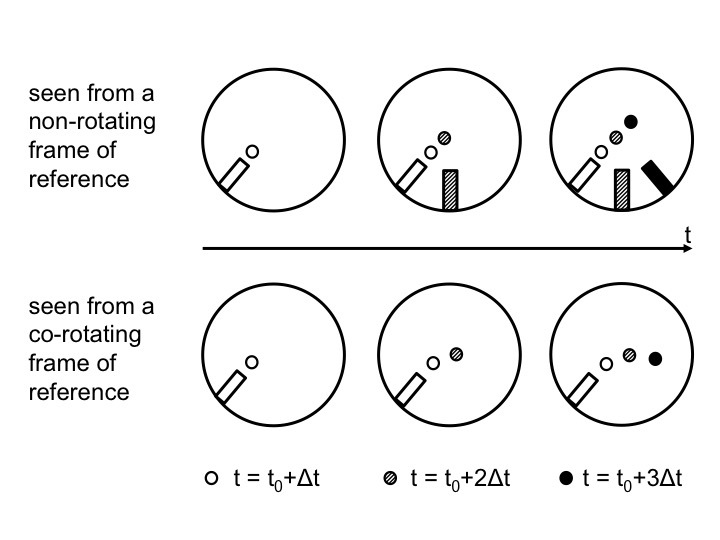 So the fact that the “catcher” does not have to move at all is counterintuitive when you are looking at the ball moving on a rotating frame of reference (because you see it moving in a curved trajectory relative to the table), and also when you expect to see a deflection because you “know” that in a rotating frame of reference you will see one (even though you are actually looking at the rotating table from the outside, so you are still in an inert system of reference). Does this make sense? The point you are trying to show makes sense. IF an object moves in a straight line (in inertial frame) towards the center, than the objects behavior is as you say. However, you say the students are confused about that, and so expect that in your experiment the ball will swerve in nonrotating frame. My point of confusion is that in the experiment that you describe, it looks to me like the ball actually *should* swerve [again, viewed in nonrotating frame] because of initial velocity when leaving launcher and friction with the table. I’m surprised that the ball goes straight through the middle as viewed from the nonrotating frame. I am embarrassed to say I clearly never thought this all the way through. Initial velocity: When the ball is launched from the little slidy thing, you are completely right! However when launched by a student from outside the rotating frame, there should only be a radial velocity. Agree? Friction: True too, if friction is large compared to everything else acting on the ball. But that does not seem to be the case, or we would see the “catcher” having to move position (which we actually don’t, or at least only so very little that we didn’t notice).